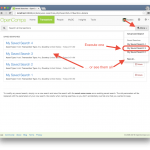 Very excited to introduce our latest new feature: the ability to save your searches. 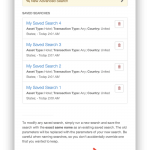 Long requested, the feature is a fantastic tool to re-create a search with one-click or get automatic email updates of new transactions matching your search. 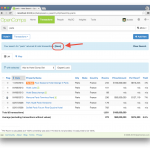 You can make OpenComps reach out to you with updates, staying in the know even if you are not visiting the site regularly. Whenever you execute a search – a simple or an Advanced Search – you now have a Save link/button next to the search results summary. Click it to give your search a name and choose a notification schedule, if you would like to receive email updates. Once you save your search, you can access your search using the More dropdown at the end of the search bar on the desktop or the Advanced tab on the home row on your mobile. Once saved, you can “run” your search again at any time from the More dropdown (which shows the latest 3 saved searches) or the Saved Search management panel (follow either the “Manage saved searches” or “See all” link at the bottom of the More dropdown). Saved searches are always displayed in reverse chronological order (newest to oldest). 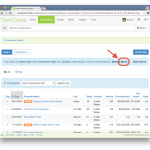 Basic (free) users can save up to 3 simple searches. PRO subscribers can save up to 10 simple or advanced searches. With the ability to save your search and receive updates, the existing Advanced Search functionality – available to PRO subscribers only – becomes turbo charged. It is now easier than ever to quickly execute an often-done Advanced Search (incorporating a Proximity search, if desired), which gives you field-specific precision and accuracy compared to the broad simple search. 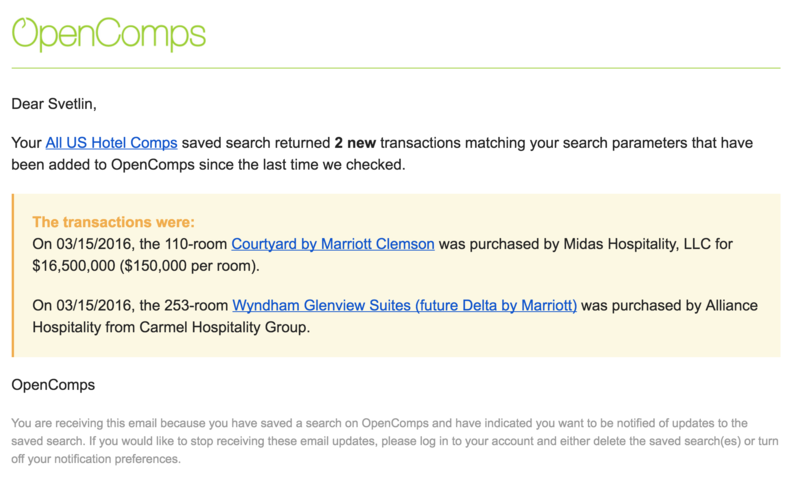 And with email notifications turned on, you can now receive precise and accurate updates on the markets or deal specifics you care about without having to constantly log into OpenComps. We like to think of this as the OpenComps Executive Edition: set several advanced searches with precise parameters of the markets or deal specifics that you are interested in and receive timely updates via email. It’s a great way for senior managers to analysts to stay in the loop. You can choose to get updates on your saved searched once a day, once a week or once a month. You can set up an individual notification setting for each saved search or you can choose to set the notification based on a master notification setting. You can control your master notification setting in your Saved Searches management panel. Setting your saved searches to “per master” notification setting is a great way to quickly turn off a group of saved searches or re-assign them to a different – daily, weekly or monthly – notification schedule. We hope you enjoy this new functionality. If you have any comments or further ideas, please don’t hesitate to get in touch. This entry was posted in Updates and tagged new feature, search on March 16, 2016 by Svetlin.